This wasp was moving very quickly. I took as many pictures as I could before she hauled her prey off into the leaves. 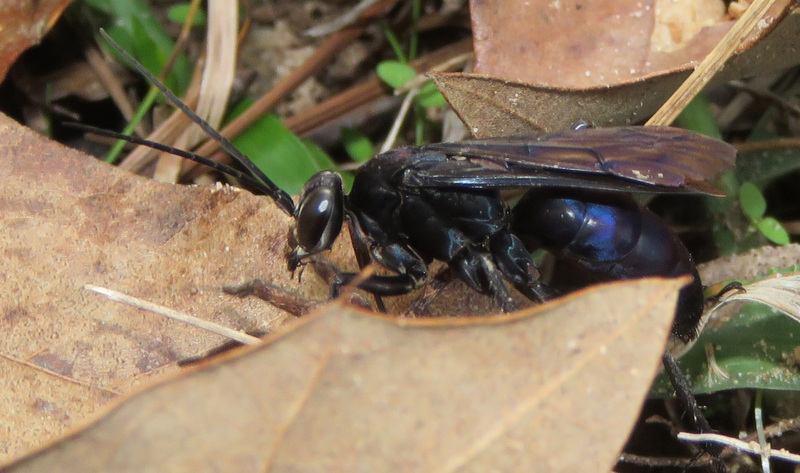 In trying to identify her, I learned that since her prey was a wolf spider, she could be an Anoplius aethiops wasp. I had no idea that various wasp species are so specific about their chosen prey. Kaufman Field Guide to Insects of North America devotes a page to spider wasps — some prey only on tarantulas, some on crab spiders, some on jumping spiders, some on orb weavers. 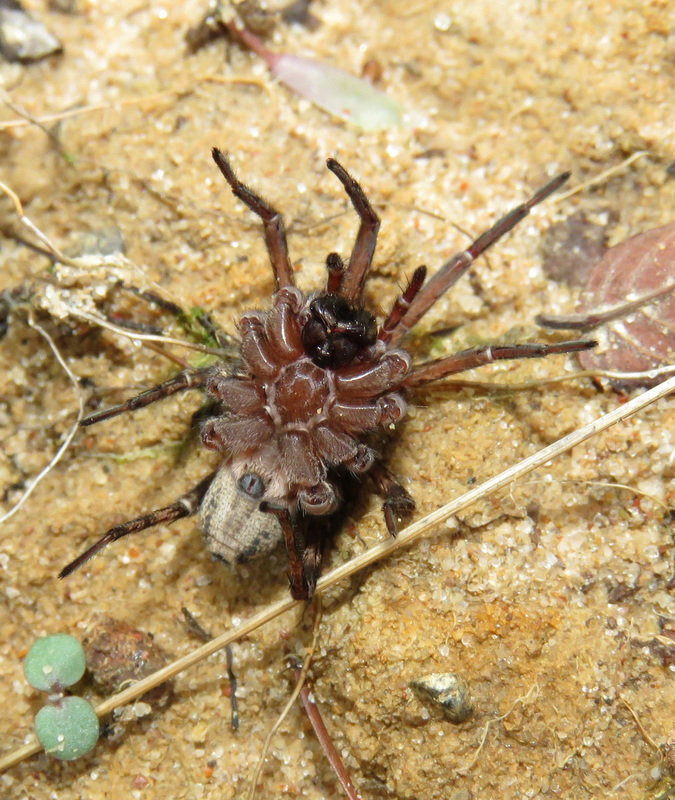 There are two different genera that prey on wolf spiders, Entypus with seven species and Anoplius with 43 different species! 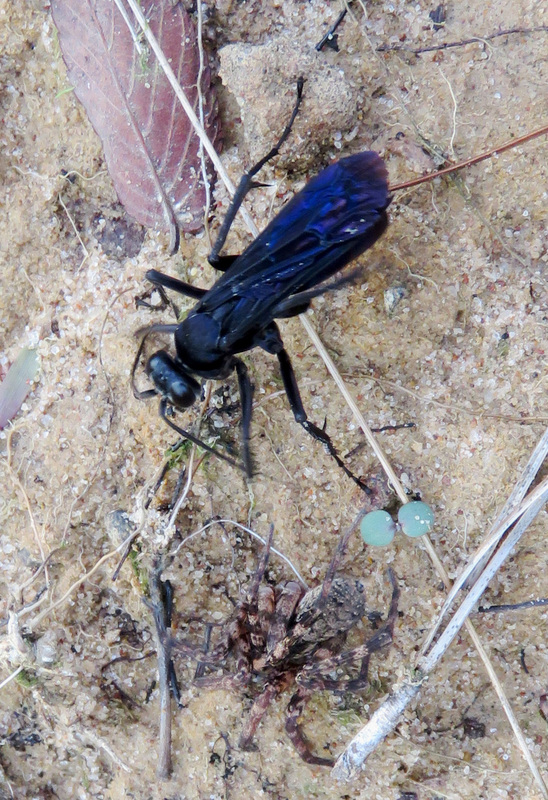 Spider wasp, possibly Anoplius. Look at how battered the edges of her wings are. You can just see the spider’s leg over the edge of the leaf. She was moving very quickly as she pulled this spider up a slope. To inculcate in the child a reverence for life and yet to keep him from becoming mawkish and morbid is truly a problem. It is almost inevitable that the child should become sympathetic with the life of the animal or plant studies, since a true understanding of the life of any creature creates an interest which stimulates a desire to protect this particular creature and make its life less hard. …the nature-study teacher, while exemplifying and encouraging the human attitude toward lower creatures and repressing cruelty with wantonly causes suffering, should never magnify the terrors of death. Death is as natural as life and is the inevitable end of physical life on our globe…The right way to teach about death is not to empahsiae it one way or another, but to deal with it as a circumstance common to all; it should be no more emphasized than the fact that creatures eat or fall asleep. Another thing for the nature-study teacher to do is to direct the interest of the child so that it shall center upon the hungry creature rather than upon the one which is made into the meal. It is well to emphasize that one of the conditions imposed upon every living thing in the woods and fields is that if it is cleaver enough to get a meal it is entitled to one when it is hungry.